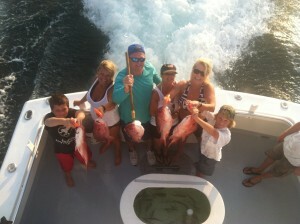 Day Trips | Destin FL Fishing Charters - No Alibi Charter Boat Red Snapper, Shark, Cobia, Grouper & More! 1st: Am I new to the game? As history has shown, someone new to deep sea fishing should probably wade before they swim. We have had some great fishing trips and only been out for 6 to 8 hours, catching red snapper, king mackerel, trigger fish, grouper and many other species of reef fish! 2nd : What species of fish would I like to catch? Or do I even care what I catch? It does matter when choosing the best trip for you and your party. Some people just want to go out for a few hours and enjoy the water, catch a few fish and call it a day. 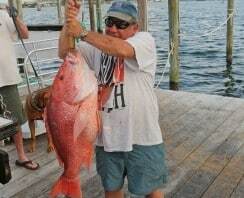 Some people want to go target deep water fish such as grouper, snapper, or amberjack. Near shore trolling can be fun, very rewarding and best of all, this can be achieved on 4, 5 and 6 hour trips, whereas deep water bottom fishing requires more time. 4 and 5 hour trips are mostly trolling trips. Though we can bottom fish on these trips, it’s very hard to get to the better fishing grounds. 6 and 8 hour trips are usually combination trips. Some time spent bottom fishing for red snapper, trigger fish, and other assorted reef fish, and some time spent trolling for king mackerel, spanish mackerel, wahoo and other assorted pelagic fish. 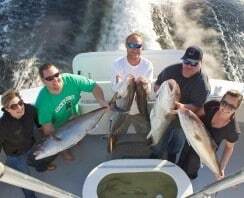 10 hr and longer trips are generally targeting reef fish such as red snapper, grouper, and amberjack. Now again, nothing is set in stone, we are here to try to give you the BEST possible trip we can in the time you decide. We have loyal customers that fish with us every year that book 12 hour trips who only want to troll. We also have 6 hour customers that prefer nothing but bottom fishing. 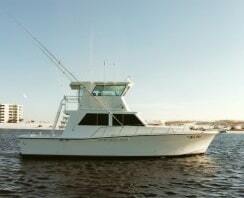 What I have laid out is the general styles of trips and the general styles of fishing. The choice is always yours, and you can be assured the crew of the charter boat No Alibi will do everything we can to insure you have a GREAT trip! Still can’t decide? CALL US! We encourage you to call, ask questions, ask for advice, and get a fishing report! In the 10 years I have spent charter fishing, I have learned if you have a GREAT day bottom fishing, but you wanted to troll, you will be disappointed at the end of the day. Choosing the right trip is the first step in having a great day on the water!